You or Me? 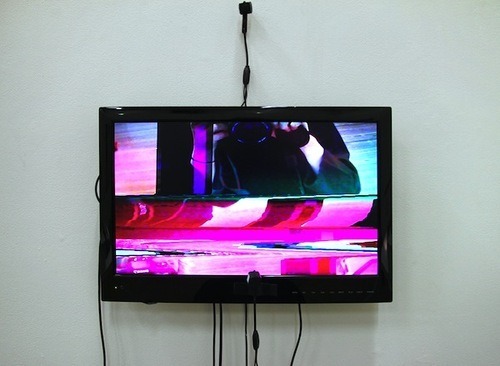 (2011), the title is a question posed by a monitor and camera assemblage to the viewer. This work was originally exhibited in a gallery window facing the street. The work involved two small pin-hole colour surveillance cameras, an RCA splitter and a large LCD monitor. Both cameras were secured to the monitor, one on the left with its lens facing out towards the street, the other on the right, with its lens facing back towards the monitor itself. 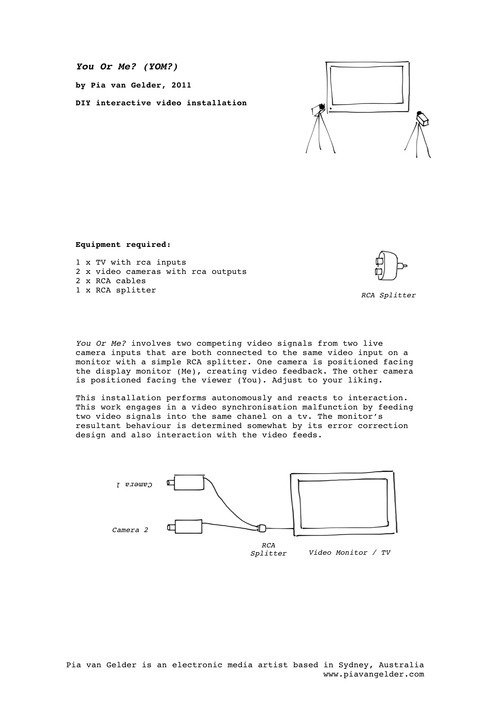 Both cameras were connected to one input of the monitor using the RCA splitter, sending two different signals to one input at the same time. The AV Bells did a similar thing when turned completely upright, sending two signals to one input on a television monitor causing the monitor to interpret both media simultaneously and as a result, idiosyncratically. Both of these works engaged in a synchronisation malfunction; the monitor’s resultant behaviour being partly determined by its error correction circuitry, and how this circuitry dealt with multiple simultaneous signals. In You or Me? the resulting competition was between two signals, one that reflects the viewer in front of the monitor - “you”, the other that reflects the screen itself - “me”, opening video feedback between the camera and the monitor. You or Me? does not require interaction through direct contact, nor does it involve pre-existing media. In this way the work is autonomous. It is a dialogue between an assemblage of machines and their environment. Interaction is only a bi-product, generated from the viewer’s presence in the camera’s frame. Like a witness who is dragged into the drama of an accident, their image becomes part of the live feed by proximity. This machine assemblage performs independently, creating a composition of live moving images for the viewer, regardless of whether they are present or not. Stuck in a conflict between incoming information, the monitor switches erratically; signal one, signal two, signal one, signal two… and leaves a visual reflection of its confusion in glitches and malfunctions. Sometimes the screen is black reading ‘no signal’, correcting its error, then spluttered imagery appearing suddenly and then disappearing. Set up You or Me? in your own living room using the instructions provided. You or Me? is an open source DIY installation.